Surfers Against Sewage (SAS) is proud to be joining forces with adventurer Ben Fogle to kick off this year’s project at Bournemouth Hengistbury Head from 2pm-5pm on Saturday, April 14th. Building on the huge success of 2011’s incredible series of events, the SAS Barefoot Wine Beach Rescue Project will run throughout the spring and summer with environmentalist and adventurer Ben Fogle as ambassador. Ben will also be personally hosting several of these coastal events alongside Surfers Against Sewage and we are calling on beach lovers in the Bournemouth area to come and join us and volunteer to keep their beach Barefoot Friendly. The 2011 Barefoot Wine Beach Rescue Project saw over 1100 volunteers remove 2.5 tonnes of litter from the UK’s coastline, and 2012’s series of events aims to encourage more people to keep the UK’s beaches barefoot friendly. To register for an event please contact Dom Ferris on dom [at] sas [dot] org [dot] uk. Volunteers will learn more about SAS’s year round environmental projects and spend an afternoon collecting litter along their local beach, and end the day with a celebratory glass of Barefoot Wine. Britain has the thirteenth longest coastline in the world and our beaches provide a fantastic day out for everyone but currently there are almost 2,000 items of marine litter for every km of the UK’s beaches. One of the most found items of litter is cigarette butts with approximately 4.5 Trillion cigarette butts are littered across the world each year. Laid down end-to-end they would reach around Great Britain’s coastline over 4000 times. To register for this or any of the other 13 events, please contact Dom Ferris on dom [at] sas [dot] org [dot] uk or call 01872 555 953. For further information, please contact Dom Ferris, SAS Campaign Officer, on 01872 555 953. 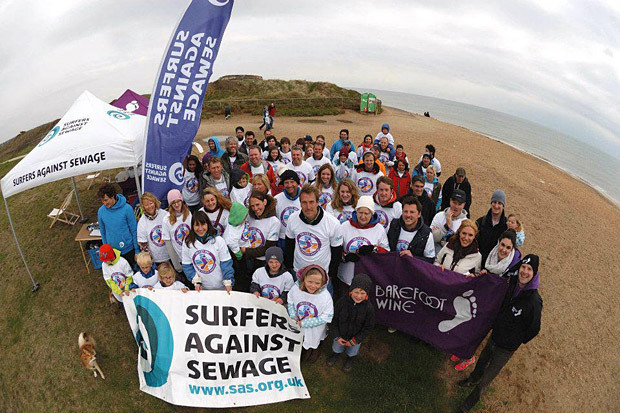 Barefoot Wine is very proud to be working with Surfers Against Sewage for the fifth year in a row to help keep Britain’s beaches ‘barefoot friendly’. Ben Fogle will be a great inspiration to people in 2012, which is set to be our biggest and most exciting year so far. All our Barefooters are really looking forward to helping out at the clean ups and then thanking our volunteers with a well deserved glass of Barefoot Wine! Here at SAS we witness the impact that marine litter is having on our beaches every day. The Barefoot Wine Beach Rescue Project will give the UK’s coastal communities another opportunity to make a real and noticeable difference to the health of our precious coastline.